Beneath the turbulent seas, beyond the smokey depths, lies a Kingdom that exists in your wildest imagination. 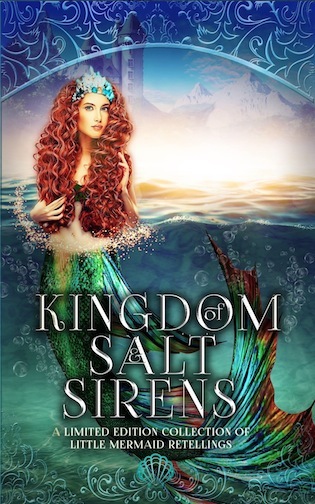 A world where mermaids swim, sirens sing and shipwrecks hide mysterious creatures. One click now for your happily ever after. I shuddered. “That’s horrible. Did she do it?” If she had, then maybe it would explain why humans seemed to be so against the mer. “Sylphs?” I’d never heard of them and had no idea what he meant. They certainly weren’t part of the stories I’d been told as a child. “I suppose…” Though I didn’t like to think of the mermaid I’d heard so much about as nothing more than fiction. She’d been an inspiration to so many young mer who wanted adventure. Not so much on land, but out in the open sea. “You never know, maybe one day they’ll be telling our story like they do hers,” he said jovially. “Wait!” The little human lurched forward, a single hand outstretched, the other anchored firmly to the ship’s railing. It swallowed as the little monster raised a brow to her. The hand fell lamely back to her side. “I am a monster,” she said simply. A thrill spiked through the little monster. Why hadn’t she thought of this before? She deserved her own name. She was the best of her kind. There was nothing in the sea that could best her except, perhaps, the sea itself. And that made choosing a name simple. “You may call me Mara,” she said. Another thrill surged within her as she nodded, knowing the word belonged only to her. The little human had understood the meaning instantly. In a way that prey was not meant to understand its hunter. Mara dove back into the cool embrace of the sea, feeling Amista’s eyes on her back as she swam away. The little monster had become Mara. The little human had become Amista. I was hoping you might review my book. It is called Akropolis by HC Edwards. It is on Amazon and if you have kindle unlimited it is free, as well as free in the lending library. If you have neither of these I can send you a digital copy if you like. The book is a post-apocalyptic thriller.